The Vision X30 elliptical offers a 20" stride length, 23-lb flywheel, high gear ratio, and your choice of three different consoles. When you order an X30, you choose from one of three consoles: a Simple LCD console with 16 programs, a Deluxe console with 20 programs, or a Premium console with a full color screen and even more programs. Feedback on all three consoles include speed, time, distance, pace, resistance, watts, RPM, calories, heart rate, and % max heart rate. UPDATE: The X30 is no longer available, replaced by the all new and improved X40 model. Check them out on sale here. Reviews on the Vision X30 elliptical are above average as expected, about in line with its cousin models from Livestrong (also made by Johnson). These trainers are built with Quiet-Glide™ drive technology that features a multi-ribbed SuperQuiet Poly-V belt drive train, friction-free Eddy Current Brake system, and a 23-lb weighted flywheel for super smooth performance. The Vision X30 has other interesting features such as a narrow pedal spacing of 3" for a comfortable stride stance, a low step-up height, contact heart rate sensors on the stationary handlebars, a free telemetric heart rate strap (included with the Deluxe and Premium consoles), multi-position moving handlebars, soft rubber footpads, and a generous parts and labor warranty. 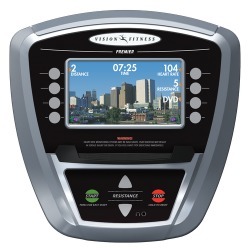 The Simple LCD console has the basic programs (manual, muscle toner, fat burn, intervals, incline, rolling hills, and mountain), plus contact grip heart rate monitoring. The blue backlit Deluxe console offers the basic programs plus the Sprint8* feature, and a scrolling message bar. The full color Premium console offers 4 changeable background scenes, a slideshow for your personal photos, DVD and iPod compatible ports, Sprint8*, and programs that include custom, goal, and heart rate. *The anaerobic SPRINT 8 program is found only on Vision Fitness cardio products. These highly charged 20-minute workouts work for all fitness levels to help you release your body’s fitness growth hormones to cut body fat, tone muscles, increase energy, and improve your appearance. The Vision X30 is priced at $1,299 (Simple Console), $1,599 (Deluxe), and $1,799 (Premium). It’s is interesting to note that the lower priced X20 model has basically the same flywheel, components, frame and design as the X30, with the only difference being the moving handlebars, cushioned footpads, and a longer warranty added to the X30. The choice of 3 consoles is also available on either the X20 or X30. 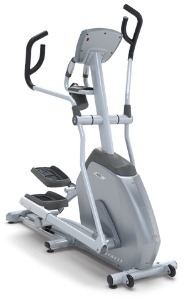 If you are considering the X20 and will buy an extended warranty, then the Vision X30 elliptical is the better buy; otherwise, go with the X20 since offers the same drive train technology for as low as $999 with the Simple console.